University Relations’ Web Services has made some changes for 2015. By now, many of you have had the chance to work with the new Site Edit. Hichame Asrary, our web trainer, has created a new Tridion manual to help you navigate the new procedures. Please be sure to refer to the updated Tridion manual when creating and editing content and uploading pictures or documents. Please send any questions or comments to webcontent@uml.edu. Everyone at the university receives the Today@UMass Lowell email. Announcements include: Featured Events, From the Top and Announcements. Featured Events are designated by our senior web editor Suzanne Dulude Potter. From the Top items are designated by cabinet members. Announcement can be submitted by anyone at the university through this Announcement form. This daily email is a teaser for two websites: one for students and one for faculty/staff. These sites expand upon daily university news. For more information about Today@UMass Lowell visit our website. The FAQ section is very helpful. Everyone with an uml.edu or student.uml.edu email will also receive a UMass Lowell “In the News” email which highlights external media hits. Hits are mentions of UMass Lowell in media outlets. Hits come from, for example, The Lowell Sun, CNN or The Boston Globe. At the bottom of the “In the News” email, there is a link to unsubscribe if recipients so wish. You’ve seen them, you’ve watched them and now University Relations will be sending you useful information through them. They are the video screens all over campus called Hawki. In coordination with offices throughout campus with oversight of specific screens, the University Relations web team will provide support through updated templates, news and event information. Have an update or idea for Hawki? Email hawki@uml.edu to contact us. We wish you the best for the new year as we try to improve internal communications! Contact us: by email webcontent@uml.edu or by phone ext. 4-3875. In higher education we frequently use words such as “online,” “student-athlete” and “on campus.” In the interest of clarity and a respectable website, we’d like to share a sample of frequently misspelled or misused words. Please see the expanded list at the University Relations, Web Services, Style Guide page. academic degrees – bachelor’s and master’s degrees (possessive), and doctorate (all not capitalized), Bachelor of Arts, Master of Science, Doctor of Psychology (capitalized, not possessive), B.A., Ph.D., M.S., Ed. D. We do not use the prefix of Dr. for faculty with Ph.D.s (Denise Smith, Ph.D., not Dr. Denise Smith). classes – The names of classes such as Economics I, Organic Chemistry II and Criminological Theory are capitalized because they are proper nouns. Academic subjects are not capitalized: physics, music, etc. department – The word department is not capitalized unless it is part of a proper noun: Department of Physical Therapy. North, South and East Campuses are capitalized. regard – In the phrase in regard to, the word regard is not plural. In the phrase, send my regards, the word regard is plural. subjects – Subjects, except languages, are not capitalized. So math, history, and chemistry are not capitalized, but English, Spanish and French are. In a paragraph, please use one space after a period, not two. Book titles are in quotes, not underlined. Please do not cut and paste from Word or another website. Laptops are customarily equipped with Notepad. Please put the content in Notepad first and then cut and paste into Site Edit. Please use Firefox while working in Site Edit. For questions about how to use Site Edit please refer to the Web Services’ site, where you will find the Tridion training manual, FAQs and contact information (and by that we mean Hichame’s ext.)! Change content on your page. Make a new component or page. See page 25 in the Tridion Training Manual. Add photos that appear within a component (embedded). Size the photo in PhotoShop (maximum width of 200 px) and upload it into Tridion, and add it to your page. Here are the Site Edit instructions for photos. The university has a license for PhotoShop, see IT for more information. Provide information to create a form. If you need a form for your website, we will create it, stage it and review it with you. Change photos that appear in the circular corner of a page. Send us the original, high quality photo either in an email to webcontent@uml.edu or via Shareit. Footer information at the bottom of your pages. There is an address at the bottom of every page called the footer. We can edit this for you. Send changes to webcontent@uml.edu. Edit the introduction on your landing page. Not everyone has this template for a landing page, but if you do send your edit to the introduction to webcontent@uml.edu and we’ll make the change. The introduction of the below landing page begins after the light-green header and to the left of the picture. Change the order of or add to your navigation. The dark blue area on the left that lists the pages within your site is the navigation (pictured above). Send an email to webcontent@uml.edu if you’d like your navigation changed. Add your blog, Facebook or Twitter feed in one of the columns on your landing page. Web Content is here to help you upload, edit and design meaningful content for your department’s web pages. This blog will address frequently asked content and layout questions, provide tips, and inform you about the web editorial process. In general, all content should follow the Associated Press (AP) style. Newspapers and organizations follow this to professionalize their content and so do we. Having the annual “Associated Press Stylebook” available (an actual book) is a good idea, but our office also provides this style guide. Dr. Brown becomes James Brown, Ph.D. (unless he is an M.D.). Use Master of Science or master’s. 3:00 A.M. becomes 3 a.m., 12 noon or 12:00 becomes noon. January 10th becomes Jan. 10. We are UMass Lowell or University of Massachusetts Lowell, not UML. We no longer capitalize university when used alone in a sentence. River Hawks is two words. Our taglines are available on the branding guide page. Our logos and PowerPoint templates are available on the logos page. The web is a great place to display high-quality photography. Low-quality photos make the university look low quality. We have hired many photographers over the years to photograph UMass Lowell events, hopefully your department or we can find something beautiful for your web page in our own photo gallery or archives. You also can purchase high-quality photos from iStock or other photo outlets (by purchasing the photo you have gained permission to use it, but read the restrictions). Do not download images from the internet and assume they are for use by the general public. Someone took the photo and someone owns the photo – get permission. Embedded Photos – If you want to embed a photo on the page see the Tridion Site Edit guide. Feature Photo Location – Web Content will size and edit photos for feature photo locations. 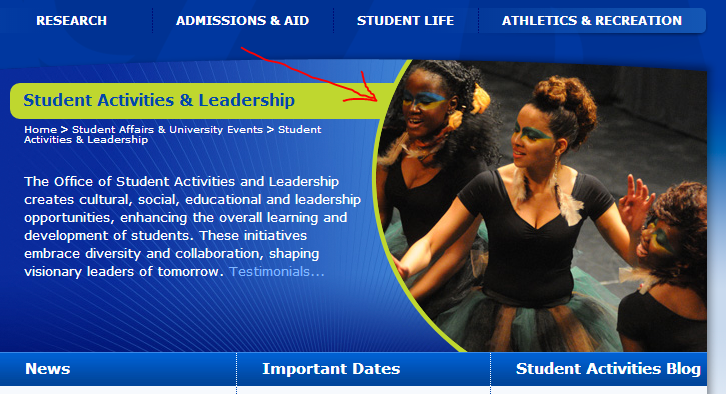 Just email your high-resolution photo and the web address (url) where you would like it located to webcontent@uml.edu. For questions about content or design call Web Content at ext. 4-3875 or email us at webcontent@uml.edu.